After upgrading the Evernote app for Mac (currently running Version 6.11 (454876 App Store)) every time I copy a line of text from a note, it adds a newline automatically. This makes it impossible for me to paste commands into the terminal amongst other things. This is a recent regression. Still not fixed in Jan, 2019. Fortunate to see this bug before deciding to buy premium. I'm giving up - this is too damned dangerous - switching to Devon. Extremely annoying, using Versie 6.11 (454876 App Store) as well. Please repair this. its really annoying to auto add newline when copy text content. Reporting in the forums works. I'm moving your post to the Mac feedback forum. 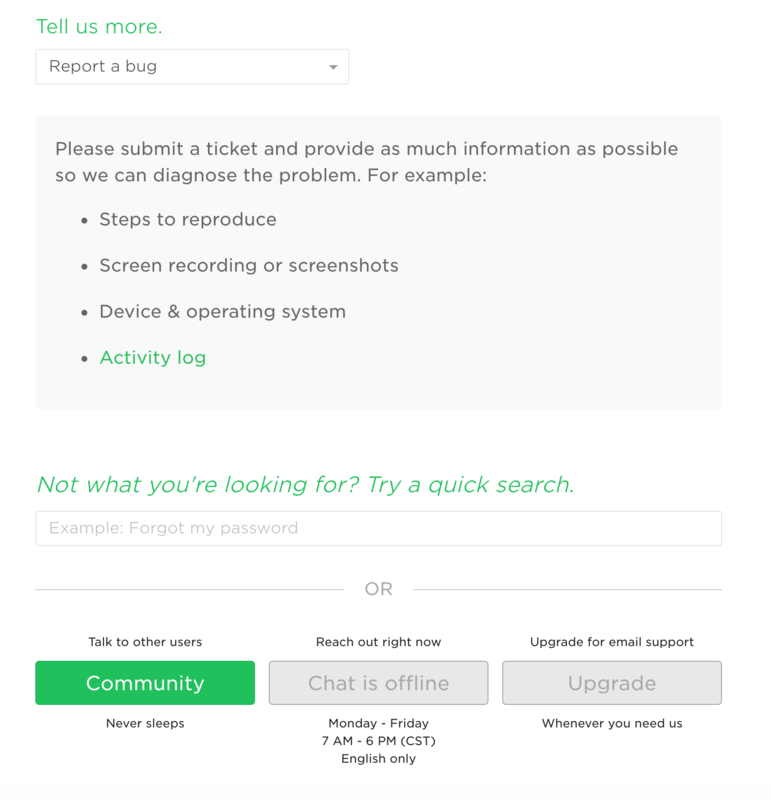 The web support page is for paid accounts and gives an option at the bottom to chat or submit a ticket. Where is the option to submit a ticket? I've attached a screenshot of what I see on that page. Also, why is chat offline during business hours? I also want to change this behaviour - This is a major pain in the a** to have evernote adding spurious newlines when copy/pasting on OSX - It also seems to be inconsistent - restarting the app appears to stop the behaviour. As has already been said - this makes evernote pretty useless for anyone who uses it to keep command line snippets. If I want a newline pasting, then i would copy it in the first place - please revert this behaviour. I've noticed this with the latest update, and it's extremely annoying. It's especially annoying when copy and pasting to a list with bullet points or check boxes, as it creates multiple lines above and below the text. Fully agree with santix and jinmin803, this has to be fixed asap. Really annoying. Going to switch to Bear again. Evernote Team, please remove the newline when copy text. Extremely annoying. Makes Evernote difficult to use for taking note for code snippets used in a terminal. Any word on this? I really hate the extra newline on copy paste. Please fix. Not fixed, so annyong when moving around stuff for example within a log or whatever... Iam getting a good old feeling of the old days of MS word on this on how maligned that software was... I also have a damn annoying issue thats fresh where I cant copy and paste stuff, have to restart the app. Has this been fixed in any Evernote update yet? I'm noticing the problem now in the Mac app 6.11.1, and I'm wondering if it will be fixed if I upgrade to a later version (I generally don't update unless there is a particular fix I want, in case other features get broken). Has anyone seen a response or a bug ID? Is Evernote even aware of the issue? I am on Evernote 7.8 for Mac and I'm hitting this issue. This is making Evernote unusable. I'd also like to know when this will be fixed "again". It's causing a lot of pain since some commands I copied from Evernote just ran unintentionally after paste into a terminal window. Same issue with 7.8 here, macOS 10.14.2, so annoying! This is driving me nuts. Please fix this. I am wondering if this behavior has recently been introduced with Evernote as I am very sure it didn't add the newline when copying from Evernote a couple of months ago. I use Evernote for saving commands I use in Linux terminal a lot and these added newlines aren't just annoying but really dangerous. This is really a security risk for my work. Sorry, but I will have to cancel the subscription if this behavior isn't changed fast. Has anybody heard from Evernote team? I hope they fix it ASAP.. Or at least I want to know they recognize this bug. Oh my god. Thanks. I will do that and never upgrade the Evernote again. Guys, good advice – Switch to Notes app, it is free, synced across devices, and doesn't have issues with clipboard! Do you have any other "good advice" to share? Just wanted to let you know we're working on updating our text editor and this issue has been addressed in the new version. We're still testing the new editor and working on enhancements so I don't have a date for a release yet, but wanted to let you know we've heard you and addressed the problem. Oh, wait. Which version are you mentioning? I know you had fixed the issue, but this was re-introduced in version 7.8. Version 7.7 is fine. But some reports say 7.9 beta2 also has the same issue. Does "the new version" mean "the NEXT version"? Or does it mean, "the next MAJOR" version? This issue is overwhelmingly aggravating, and there seems to be little reason for it. I want to clarify as it will inform my, and possibly others', next steps. Fail! 7.9 STILL HAS THE SAME ISSUE. While not a solution, there is a work-a-round to this annoying issue for those pasting code into macOS Terminal. Using iTerm2 instead of Terminal, you'll be prompted to Paste Without Newline. Not ideal having to use one program to overcome the shortcomings of another, but it gets the job done. I've downgraded into v7.7 and happily copy and paste into terminal. At least it does solve the problem - and has taught me a bit of a lesson. Me, too! NEVER UPDATE THE EVERNOTE. Yes, yet another unwelcome surprise from the ever-asleep team at ever-not. Guys @EvernoteTeam it's a simple request, please fix it as it's really messing up the whole experience! Downloaded 7.10 beta and still having copy/paste issues. Paste by command V does not work but paste and match style by the menu does work...... Pretty frustrating. How hard can it be to remove the extra added line feed from copied text again?